The creative writing major at Miami is a thriving program, one of the largest in the United States, with an increasingly global curriculum and outlook. With eight full-time creative writing faculty, more than 150 undergraduate majors, and a new minor (as well as 20-25 graduate students), there’s a creative writing buzz at Miami. See the Creative Writing Curriculum page for a complete list of required and elective courses for the major. Fiction, poetry, creative non-fiction and screenwriting workshops led by award-winning, actively publishing faculty writers. Literature courses offer global perspectives, understanding of literary and historical traditions, and models for literary experiment. Literary Marketplace and Issues in the Profession courses focus on the business side of the literary life. New emphases in the program include translation, live performance, and writing for digital media. A senior capstone in creative writing gives students the opportunity to hone ambitious writing projects. 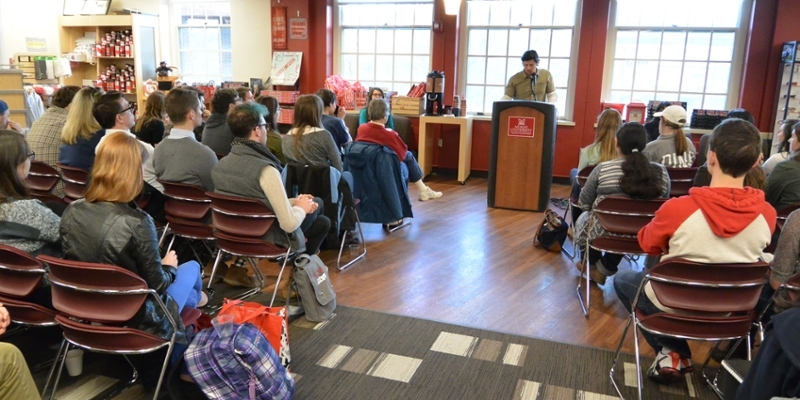 Meet the many prominent and emergent authors who come to campus each year to visit classes and give readings and craft talks. Study abroad in the popular Literary London program. Take graduate-level coursework (by invitation only). A few top students per year participate in a weeklong graduate-level sprint course that brings a distinguished writer to campus. Gain editorial experience staffing literary magazines such as Happy Captive Magazine, Inklings and Seque. Miami creative writing majors have enjoyed considerable career success. A partial list of honors received by former students includes the Pulitzer Prize (one winner, one finalist), the National Medal of the Arts, the PEN/Robert Bingham Award for Fiction, the Asian American Literary Award, the Whiting Fellowship, and the national Poet Laureateship. Many creative writing majors pursue MFAs or other advanced degrees at top programs including Iowa, Columbia, and Brown. Majors pursue successful careers in publishing, editing, advertising, law, medicine, and the business world. See Internship and Job Resources for Creative Writing (Career Services). Creative Writing Program at Miami University shared a post. Committed to excellence in teaching, scholarship, and creative performance, our undergraduate and graduate degree programs in Composition and Rhetoric, Creative Writing, Linguistics, and Literature place this community at the center of liberal arts education at Miami.